We all have studied modifiers in our school days. But since it is an optional element in the English language, it is not treated as an important topic. Then why do you need to learn about it now? Well, CAT and other MBA entrance exams often feature questions based on Sentence correction and these questions often contain modifier-based errors. Apart from that, it will help you improve your grammar and aid in tackling the verbal ability section. But, what exactly is a modifier? What if, you want to be more specific while describing something? Well, that’s the very purpose of modifiers. As the name suggests, modifiers modify the meaning of the sentence, by making it more specific and detailed. Basically, modifier adds to the meaning of another element, on which it is dependent. The grammar of the sentence won’t be affected if you remove modifiers from the sentence. Starting with the adjective modifiers, why do you think we need adjective modifiers? As you already know, adjectives are describing words. It modifies and describes a noun or pronoun. An adjective can function as a modifier in form of a single word, a phrase or a clause. Let’s discuss some examples for better understanding. In other words, adjective modifiers answer the following questions with respect to the nouns they modify: What kind?, Which one?, How many? and, How much? Another important type of modifiers is adverb modifiers. As you would guess, adverbs modify verbs, adjectives, and other adverbs. Similar to adjective modifiers, adverb modifiers feature in form of a single word, phrase or a clause. Let’s explore the various kinds of adverb modifiers with the help of examples. By now, you must have observed that the adverb modifiers function as an answer to the following questions with respect to the nouns/verbs they modify: When?, Where?, How often? and, How much? Prepositional phrases begin with a preposition and end with a noun. These can function either as an adjective or as an adverb to modify nouns, verbs, etc. Additionally, they answer the following questions with respect to nouns/verbs they modify: Where?, When?, Who? and What?. On the other hand, Participle phrases function as adjective modifiers to modify nouns. These begin with a past or present participle. Further, modifiers are of two types according to their position with respect to the words they modify. These are pre-modifiers and post-modifiers. Most of the adjectives are pre-modifiers as they are generally placed before the nouns they modify. In contrast, most of the adverbs and prepositional phrases are post-modifiers since they come after the verbs/nouns they modify. Let’s discuss each of these with examples. As the name suggests, the misplaced modifiers seem to modify/ describe the wrong set of words due to their incorrect placement in the sentence. Example: Mathew wants to buy a car from a sales associate with winter tyres. In the above example, which words are described by the modifier ‘with winter tyres’? Sure, it would seem that the ‘sales associate needs to have winter tyres’. Well, that itself conveys that there is something wrong in the sentence. Now, what do you think will be the correct sentence? Correct sentence: Mathew wants to buy a car with winter tires from a sales associate. As you would guess, this sentence definitely conveys the right meaning: ‘with winter tyres’ modifies the noun ‘car’. Another type of modifier error is the squinting modifier. Sounds complex? Well, that’s also how it is to identify this kind of error. Basically, this error is caused due to improper placement of adverbs in the sentence. In such a case, the structure of the sentence may seem correct but the meaning becomes ambiguous. Example: Students who skip their lectures often score poor marks. Students who frequently skip their lectures score poor marks. Students who skip their lectures will score poor marks frequently. Students who often skip their lectures score poor marks. As you can see, there is no ambiguity in the meaning of either of the sentences. For the obvious reason, squinting modifier is also called two-way modifier. The third type of modifier error is the dangling modifier. As the name suggests, a dangling modifier appears in sentences that seem incomplete. Such modifiers are placed in the beginning of the sentence which seems to miss the part being modified. Generally, these modifiers exist as participial phrases, prepositional phrases, or infinitive phrases. Example: At the age of seven, my family went on a trip to Victoria Falls. When I was seven, my family went on a trip to Victoria Falls. Here, the phrase is changed to a dependent clause ‘When I was seven’. Let’s take another example to get a better understanding of dangling modifiers. To win the task, she made a great effort. Try to place the modifier as close as possible to the word it modifies. This especially applies to adjective and adverb phrases, and clauses that start with who, whose, that, and which. Adverbs like only, just, nearly, almost often feature in error correction questions. Makes sure that they precede the words they modify. In case of dangling modifiers, there would be no word for the modifier to modify. In such sentences, add a noun/pronoun right after the opening modifier or insert the noun being modified to the opening modifier itself. If a modifier appears to qualify the words before and after it, change its position in the sentence. This is often the case with a squinting modifier. Prefer to use an active voice in sentence correction. Finally, avoid using too many modifiers as it results in confusion regarding the meaning of the sentence. 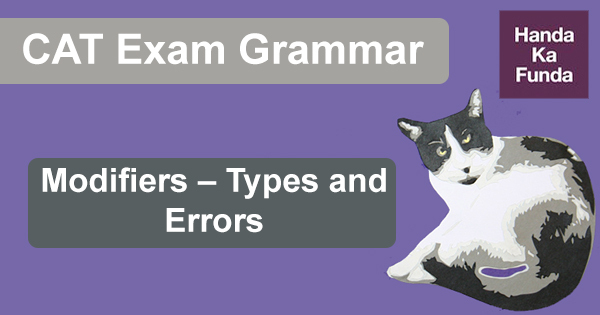 Now, you are well-versed with the different types of modifiers as well as modifier errors. The last step is to implement the above-stated rules and invest a good amount of time in practicing error-correction questions.